Forum reserved for discussing specific points of the story—mostly from the manga. Be warned, these discussions will be current with the manga and will spoil many plot lines for anime-centric fans. Now, you can disagree all you want, but I dare you to disagree that "Haibara cleared Kuroda off BO affiliation much earlier." I dare you to disagree with the fact that "Rum is a man, not an Woman." Now, I am daring you to disregard these two "Narratives" before plunging further into Rum arc. If you have done that, then this reply is pointless, then You don't follow the narrative at all. Even if people called Rumi as "Rum", I would have considered that as Joke panel. So even before the the three suspicious persons are shown taking an interest in Kudo Shinichi, two have been vetted out. Now among the Kohji case players, two non-Rum players emerged and one of them was rumoured to be female, while the other being male. Ta-da, we have an indirect framing of both Kuroda and Rumi. But guess what, these two are your two theories, so you find it unacceptable as framing. Fine by me. Let's wait and watch to see who comes over the top. Last edited by Zerozaki4869 on October 31st, 2018, 5:05 am, edited 1 time in total. Can you elaborate? I am not getting what you are trying to say here. You didn't follow the thread and it doesn't concern you. (If anyone is making claims without reading what I've written then they are targeting me, not replying.)" So if Kuroda, Kohiji is RUM, then where does the feminine aspect of RUM comes in? Why would BO members report seeing "him" as female or "her" as a male? Put on mascara could be a red herring implying that RUM is someone wearing a disguise, so could either be a male dressed up as female or a female dressed up as a male? No, first get the shogi shaped pill case of Haneda Kohji, only then I'll share my thoughts with you, eh?? I think pretty much noone is targetting you on a personal basis. if those claims/ guesses/assumptions are facts will get tested a bit harder. Ur current claim is: Kuroda is being portrayed as a Tsutomu-redherring by the manga. Kuroda in direct connection to Tsutomu. Not even a _highlighted_ paralleled behaviour, absolutely nothing. I agree with MTX: Kuroda, Rumi and Wakita are all being portrayed as Rum at times. Wakita - right after his intro - by Conans thought, by the "closest to the boss"-Yaiba-thing, by him being Kogoros disciple (like Bourbon was). I really dislike how you start the conversation with an imputation. I am following the thread and simply dont agree with ur perception. Does that mean automatically that me or someone else is targeting you personally ? Surely not. Anyways, lets cut this topic since I doubt that u will change ur view. Again: Only because I dont agree with your perception then Im not following the narrative at all? Guess then MTX doesnt follow it aswell. Or a large majority of the poll-users which consider Rumi or Kuroda being Rum. Haibara cleared Kuroda off BO affiliation much earlier. Most people does not seem to care much about that aspect looking at the polls. It seems that his intro + "Bourbooon" made more impact than Haibaras scene. 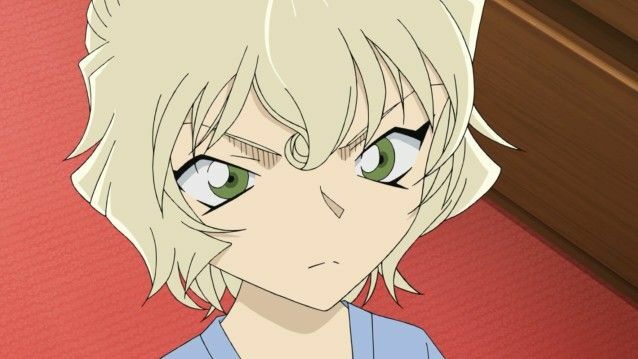 If it would be absolutely clear to everyone than Kuroda wouldnt be in the "main 3" or Gosho wouldnt let him do the Bourbon-scene. I will write an own post about "Rum=man" for better readability. I don't understand what's there to argue about who the main three Rum suspects are or what narrative the manga is trying to frame. It's clear as day, and if it isn't clear enough, there's supplemental material that makes it even clearer. Whether one thinks Rum couldn't possibly be a woman has no bearing on the framing the manga's going for. Well... I thought it was clear too. Wakita / Iori / Chikara as the three main Rum suspects. Atleast Im pretty sure that you wrote sth like this somewhere. He discounts Kuroda/Rumi as framed Rum suspects for the said reasons. 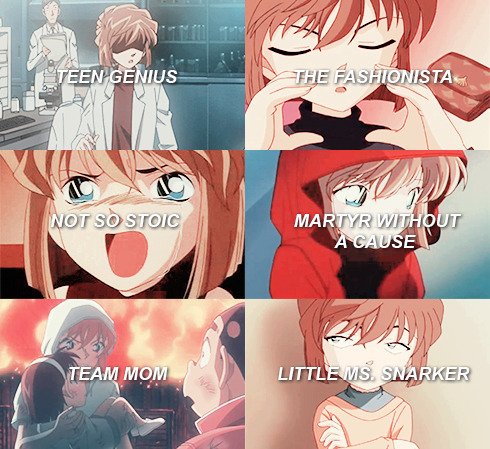 Guess it comes down to whether one thinks Gosho will break his own pattern. Im on the side who considers this atleast possible - or atleast some sort of "cheating" might be going on. For example a seemingly female person will end up as male. The narrative itself atleast seems a bit more open minded by mixing Rumi in. @DCCD, I wasn't accusing you, I merely mentioned that you didn't follow the convo/reason for I called out Spimer. Giving an counter-example to invalidate the point that naming similarity doesn't doesn't necessitate a connection, doesn't mean that the said counter example is a belief of the argument provider. Now Tsutomu's body not being found gives room to the possibility of an alive Tsutomu. It nowhere means that the argument provider believes that Tsutomu is dead. Now if you think that these are my beliefs presented without a shred of evidence be my guest on hating me on a personal basis. My only gripe is that a)I never challenged you for not following my perception, I just challenged you on whether Rum being a man and Kuroda getting swatted of by Haibara for lack of BO aura is part of the narrative/narration or not? Now at the similar time two Non-Rum persons involved in the same case were introduced, one male and the other being supposedly female. Both their aura's matched with Kuroda and Rumi's aura. Also the three so called suspects were called into action after we got two extra players in Kohji case. If these three were called into action before the mention of Asaka and Tsutomu, then I would have entirely supported your line. But you can still disregard me, but the fact is that these three were being framed (as suspects) after the mention of Asaka and Tsutomu. So you will have to acknowledge(you can disregard it all you ,like it's your opinion, but...) that Kuroda comes on as primarily the missing man suspect,with interest in Kohji case, Rumi comes off as a primarily supposed missing woman suspect, with interest in Kohji case. Because their Rum framing is just too feeble to begin with. Rather it is the indirect framing, Tsutomu=Kuroda, Rumi=Asaka at work. Yes I think Wakita, Iori and Chikara are the only Rum suspects whose credentials are not severely hampered. Wakita is framed as Rum, Iori is implied to be something more than his current position plus getting Rum body-type(effeminate man) which had taken a back-seat and Chikara as someone closely tied to Haneda case by his Shogi and having all three descriptions of Rum. So yeah these three are my three Rum suspects. yes, exactly, these are your suspects, not the narrative's. One thing you seem to overlook is that red-herrings can also be considered "suspects". Just because the narrative hinted at Kuroda being non-BO doesn't mean he loses his narrative portrayal as a Rum suspect. 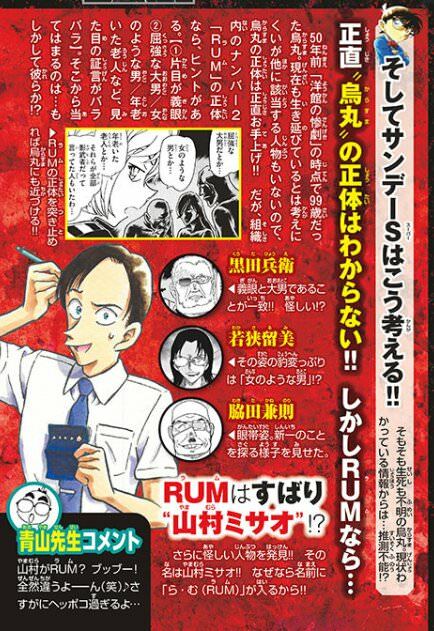 His constant reappearances in panels along with the other two suspects respectively (mimicing the Bourbon suspect narrative style), his interest in a Rum-related case, as well as the "Bourbon" scene are clear indications to that. Gosho does this all the time, where he shows contradicting things in his suspects to give the mystery some depth and misdirections. As readers, we are supposed to figure out the truth from the misdirection, not redefine the story/narrative that is being told. End of this unnecessarily dragged out discussion. No, that's totally your way of interpreting. You seem to will-fully forget that the narrative indicates a Tsutomu and Asaka, two outlets for the handicapped Rum suspects(TBH if Haibara's BO radar gives Kuroda clean-chit and Rumi is an woman) they are not Rum anymore, they are rather interested parties because, Wakita got a great head-start on them from the same narrative. So they are not Rum suspects anymore. This is the narrative. Your point would have been good if Tsutomu and Asaka were mentioned much later, at least later than 980. But you'll disagree because You want to disagree, end of the story. Zerozaki4869 wrote: But you'll disagree because You want to disagree, end of the story. Like the glass shard? I saw you disagreeing with yourself all the time.